"My Pennsylvania Dutch grandmother, Florence Walter, used to make these. They are especially great for picnics. 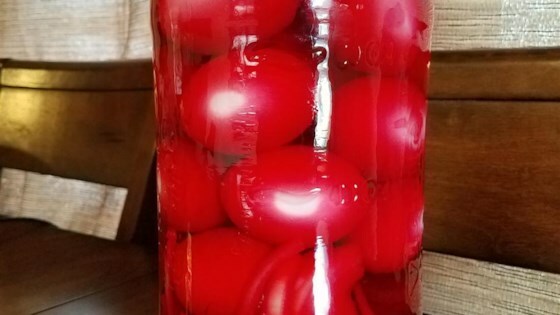 The combination of pickled eggs, beets, and onions is really something special. A great way to use up left-over Easter-eggs too!" My family has been makeing "pickeled eggs" for as long as i can remember but these are the best i have ever tasted. Although this tasted fine, there is not enough liquid in the recipe to cover both the eggs and the beets. I had to stir often, and did not get the uniform color I expected.